Are you up for fun, adventure, incredible experiences and making new friends? Are you looking for something to give you the edge in life? 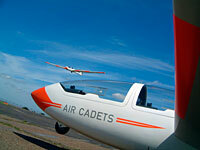 Then welcome to 1381 Squadron Air Training Corps (ATC). Better known as the 'Air Cadets', we’re part of a UK-wide cadet force with more than 40,000 cadet members aged between 13 and 20 years. 1381 (West Drayton & Yiewsley) Squadron Air Training Corps - to use our full title - is the Air Cadet unit covering the south of the Borough of Hillingdon and surrounding areas. Our catchment area is bounded to the north and south by Uxbridge and Feltham respectively, with Iver to the west and Southall to the east. There is no hard boundary however, and we will accept any cadet who lives within a reasonable travelling distance from West Drayton. If there is a closer Air Cadet unit to where a prospective cadet lives we will let the cadet know and explain the options. We're sponsored by the Royal Air Force and parented by RAF Northolt and can give you hands-on experience of activities and courses that will challenge and develop your skills to help you succeed in whatever you want to do. The Air Training Corps is the RAF's cadet force, divided into six regions, 36 wings and more than 900 squadrons within communities around the UK. We are not a recruiting organisation for the RAF but if you're thinking about a Service career, cadet membership will put you ahead of the competition. Many cadets go on to great success in the RAF (and the other Services). Around 40% of officers and 50% of all aircrew (including pilots, navigators and engineers) in the RAF now are ex-cadets. Research shows that they do better in basic training and stay in the Service longer than their colleagues. Likewise, if you chose a civilian career our research proves you can go on to achieve great things…employers just love the skills and experience that air cadets offer. Let's face it - where else would you be given the opportunity to train and learn to fly solo in an aircraft when you're only 16? Several cadets each year from West Drayton and Yiewsley do just that! Whatever you do with your life, at the end of your time as a cadet you'll be self-motivated, confident and ready for anything.